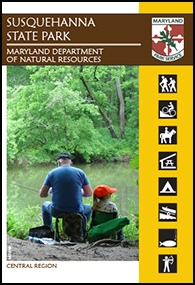 Susquehanna State Parks is one of the first State Parks to use the new Trail Guide format. This full color 12" x 16" guide folds down to 4" x 6" to easily fit in your pocket. The map and guide will help you plan a visit so as not to miss any of Susquehanna's highlights, such as the Rock Run Mill or the park's archery area. Makes a great gift too!